I admit to a total lack of knowledge about the record industry in Taiwan, beyond the fact that zillions of pirate pressings seem to have emerged from there during the 70s onwards. However they did have their homegrown legit labels, catering for the teen market as labels everywhere did. 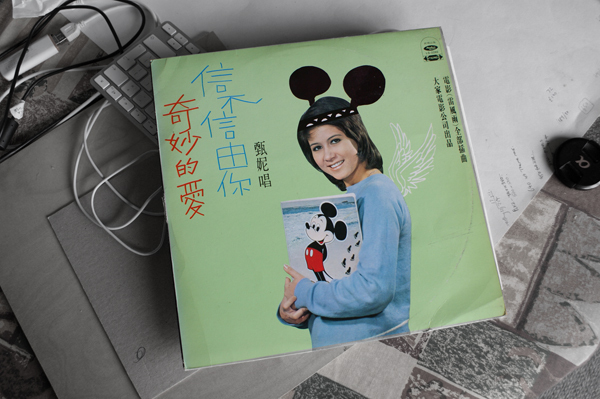 Hai Shan Records were apparently once a dominating force in Taiwanese pop, founded in 1962. Releases on this label filled the local charts and they issued many locally produced Mandarin pop songs and launched many of the top artists of the 1960s onwards. The label seems to have kept going into the 1990s before lapsing into a reissue opration to capitalise on the nostalgia market for their back-catalogue. I’ve no idea who this teen singer is (if anyone can help, please get in touch), but the strange cover image has the singer photographed grasping a Micky Mouse decorated notebook. The label designers have then painted on the headband and ears, as well as the angel wings. The cover looks sort of sixties, but it is more likely to date from the seventies judging by the back sleeve where the girl is clad in an evening dress and lighting some candles.